At first glance, there doesn't seem to be anything particularly remarkable about star HIP 11952 and its two planets. 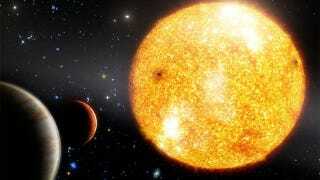 But its iron-poor composition reveals these planets are 13 billion years old — almost as ancient as the Big Bang itself. While HIP 11952 is just 375 light-years away, we can determine just how ancient it is by studying the relative abundance of different elements found n the star. While HIP 11952 has lots of hydrogen and helium, it has almost no elements heavier than those two, which means it's a metal-poor star. Such stars aren't great candidates to support planets because you need heavier elements to build planets, but it's not totally unknown — of the 750 or so confirmed exoplanets, a handful are found around metal-poor stars. Where it gets really remarkable is just how old HIP 11952 must be. As a rule, metal-poor stars formed in the early days of the universe, before stellar processes had forged all the heavier elements. According to the Max Planck Institute for Astronomy, which discovered the two Jupiter-sized planets while conducting a survey of these stars, HIP 11952 is particularly old, likely dating back to 13 billion years ago, only just over a billion years after the Big Bang. This actually helps explain how HIP 11952 could have formed stars in the first place. While it's metal-poor by pretty much any contemporary standard, back 13 billion years ago it actually would have had far more metal elements than the typical star, which explains why it could have formed any planets at all. These two gas giants likely took a relatively long time to from compared to more modern exoplanets, simply due to the scarcity of available material, but they still can't be much younger than the star they orbit. Of course, these two gas giants couldn't support life, and they're much too close to their star for even any potential moons to have much of a chance on that score. But it's entirely possible that there are rocky planets further out, if not in this particular system then around other ancient metal-poor stars. If that's the case, then these worlds would have been witnesses to the entire history of the universe — and the old science fiction trope of an alien race as old as the cosmos itself might not be so unrealistic after all. For more, check out Discovery News. Artist's impression by Timotheos Samartzides.